Boog Powell was a big power hitting first baseman who spent is most productive seasons with the Baltimore Orioles. He was a left handed hitter but threw right handed. This baseball card captures Boog Powell during his greatest years-during his career he would make the American League All-Star Team- four times and it would be four years in a row from 1968-71. In 1969 he would be second in the AL MVP voting. He would win the MVP Award the next season in 1970 as the Orioles won the World Series. In looking at his career the three years 1968-70 would also be his injury free, healthy seasons. He would play in 154, 152 and 154 games those seasons. Boog was a big man and injuries and weight problems would start to hit him as he turned thirty. Boog was a big man- he is listed at 6’4″ 230 although I suspect in his later playing days he weighted in at a bit more. My memories of Boog Powell with those great Baltimore Orioles teams is that of a big feared power hitter batting in the heart of the order along with future Hall of Famer Frank and Brooks Robinson. Powell was a solid performer in the World Series- except for the 1971 Series against my Pirates where he went 3-27. The 1971 World Series interesting- the big power bats for each team were very silent- Powell hitting .111 with just one RBI in seven games and the Pirates Willie Stargell was 5-24 a .208 average with one RBI. Boog Powell would have fine career numbers- 339 home runs, 1187 RBI’s with a batting average of ,266. He could also draw a walk-his on base percentage .361. At his peak Powell was one of the most feared power hitters in the American League. Big Boog is still living- 76 years old. 1- He had a step brother who played briefly in the major leagues- Carl Taylor played the Pirates, Cardinals and Royals from 1968-73. He played 12 games with the 1971 World Champion Pirates but was not on the Pirates World Series roster when they faced his stepbrother Boog. 2- Boog is still a big part of the Orioles- since the opening of Camden Yards in 1992 Boog has owned Boog’s Bar-B-Q outside of the ballpark on Eutaw Street. 3. Boog Powell still plays in the major leagues- no not John Wesley Powell but Herschel Mack Powell a young outfielder with the Oakland A’s. 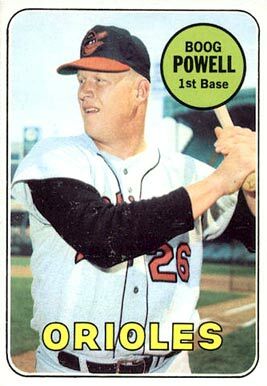 He was given THE Boog Powell’s nickname by his father to avoid confusion since their are three Herschel Powell’s- Powell’s father and grandfather share the same name. Last season the Boog Powell’s met at Boog’s Bar B-Q outside of Camden Yards.